What if you had no lines to stay inside of? Would you feel free, or overwhelmed? Have you always been encouraged to stay inside the lines? Or have you always been encouraged to make your own lines? For me, a child's drawings are metaphors for how they are feeling sometimes; colorful and messy, monochrome and neat, small and detailed. Some children prefer a guideline, while others need more space to express themselves. A see through surface can provide outlines for objects behind or underneath it, or the blank canvas needed for "self-starters." I love unique blank surfaces for children to practice their creative drawings and writings on. Plexiglass is an inexpensive and long lasting reusable surface. I have a couple of pieces I keep in the garage that I prop against a wall, or lay on top of a couple of wooden blocks for viewing different surfaces like; grass, mulch, dirt, sand, pavement, etc. Laying the plexiglass on top of the blocks leaves a space for me to put objects underneath, like leaves, sticks, small toys, or bugs will crawl through that my son can watch. The items can be arranged to make shapes to trace and outline on the plexiglass, or used as a starting point for inspiration. My one year old likes to use washable paint and window markers on the plexiglass. Cloth or sponges make wiping and cleaning up the plexiglass fun for him too. Being able to smear the colors with water creates an additional sensory experience. What is your favorite blank surface right now? Share your pictures at #blanksurface on Instagram and get ideas for other ways to "color outside the lines" with your kids! Stay up to date on all our Little Moments and more; like our Facebook page, or join us on Google+! such a clever and creative idea! Oh such flattery Jackie, you made me blush! That is a very creative and fun idea and there are so many things you could do with that. Please share this on Artsy Play Wednesday. I have been thinking about how this material can be used in other ways, I think this calls for an experiment! This is gorgeous. Such a brilliant idea! I think this would be fun for kids young and old. What a fun way to enjoy nature one spot of land at a time. I pinned this post. I had no idea! I can definitely see what a great aide it would be for landscapes! Heather, this post is so inspiring! I didn't know about #blanksurface and can't wait to check it out. The # has a small start Rachelle, but hopefully others will join in with their ideas as well to help build it! I love this idea. 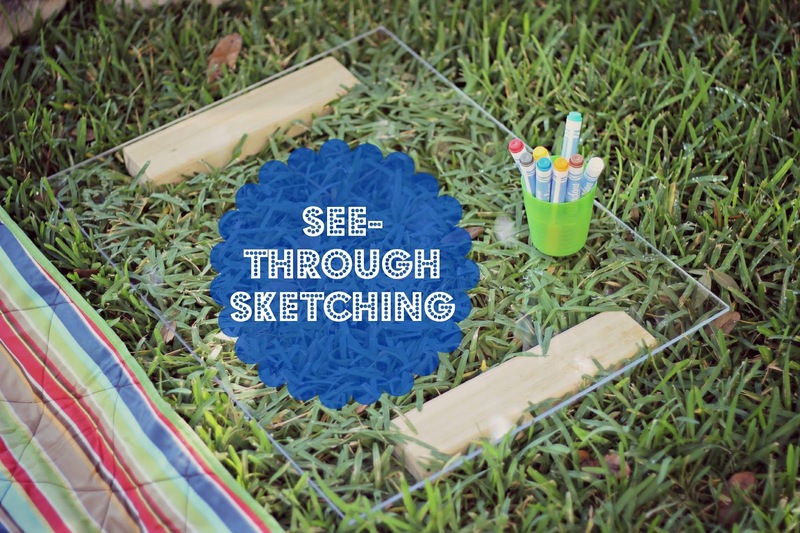 I have a plexiglass frame I was planning to use with my daughter for finger painting (and then taking mono-prints from it) but I love the idea of taking it outside. PS thank you for your comment about our family tree! I love hearing from you, stop by any time! Sharing the lasting impacts little moments can have on a child.